BANGKOK, 24 October 2011 (NNT) – More flood evacuees are traveling from Thammasat University Rangsit Campus to Rajamangala Stadium after inundation prompted a need for their relocation while a number of volunteers have arrived at the new shelter. 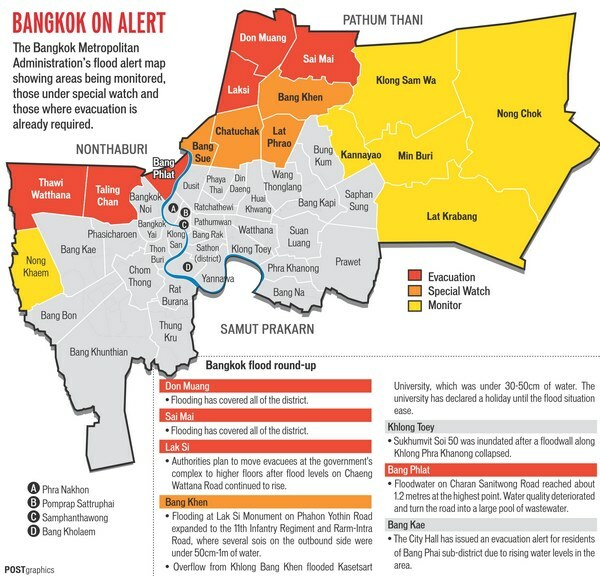 Last update : water have occupied some districts in Bangkok city area, unfortunately including Don Mueang where the government flood center has been working at. If you want to volunteer at Don Mueang, please make sure first that you give them a call to update whether DM is accessible and flood center is maintained to be there. 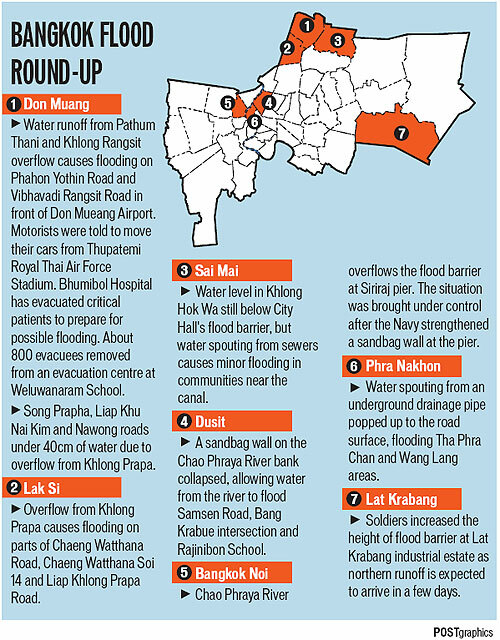 Below is a graphic showing the water inundation in Bangkok area taken from Bangkokpost. 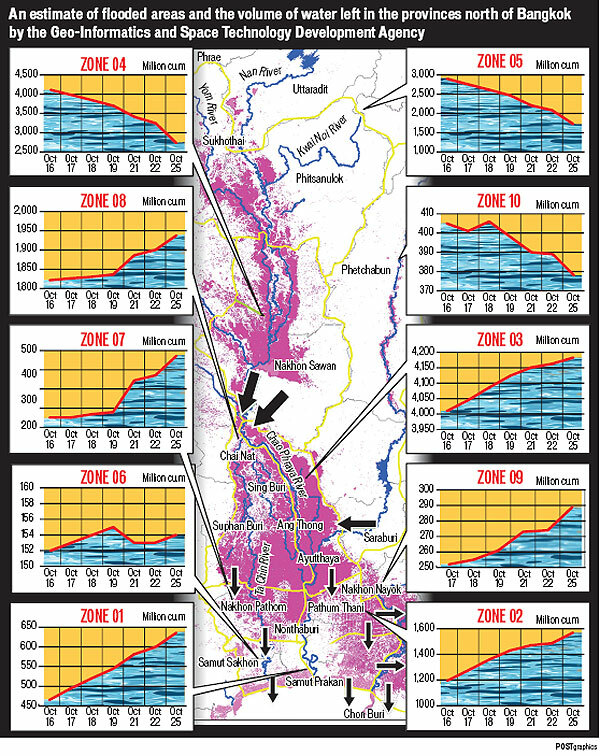 Click on image to see it clearly. 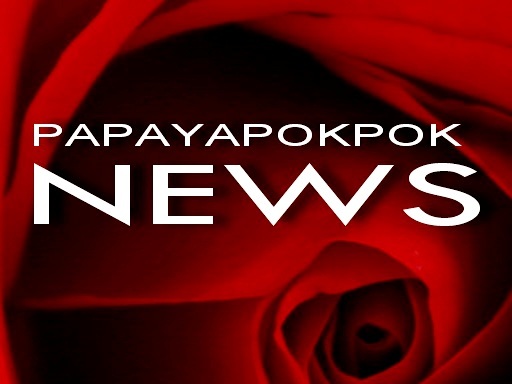 This year flood in Thailand which is said to be the worst flood in the last 60 years, if not in its history, has drawn high level solidarities of its people in the capital, Bangkok. You can see that at Don Mueang airport that currently is set as the flood management and response center where hundreds of volunteers work relentlessly to pack foods and water and to form themselves into human conveyor belt transporting the packs from the piles to the trucks. This activities go on around the clock for 24 hrs a day with trucks come and go distributing the packs from Don Mueang to many flood affected areas. The local and farang volunteers work hand in hand happily sacrificing their Saturday night they used to spend in malls or cinemas. Please see the comment field far below to see how to go/how to volunteer. Below are video and pictures I took last Saturday night (15/10/11).